Trung has over 15 years of experience in legal practice related to direct investment, securities and capital transaction, project financing, private equity, commercial and corporate matters, and 6 years of general and investment compliance. Trung started his legal career by joining two leading local law firms, where he earned knowledge and experience in FDI projects, M&A, commercial practice and litigation. He later joined a multi-national FMCG company as an in-house counsel and was responsible for commercial, regulatory and corporate matters of the company and its joint-venture with the largest tobacco corporation of Vietnam. He then moved to Manulife Financial as legal counsel and compliance officer, where he was in charge of legal and corporate matters of the life insurance company and its subsidiary being a local fund manager and was involved in legal and regulatory preparation for a public fund. He was also responsible for general compliance and investment compliance of both companies, including building and implementing key policies inherent to their respective business. 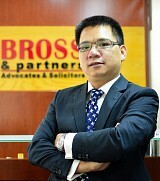 Trung had been General Counsel and Chief Operating Officer at Saigon Asset Management (SAM), who manages two funds listed on Frankfurt Stock Exchange with total asset value of US$125 million investing in private equity, OTC and listed stock and real estate projects, for 4 years (2007 – 2011). He then resigned from full-time management at SAM but still acted as an external advisor of the company before he has become a member of its Board of Advisors since 2014. Trung is an arbitrator at Vietnam International Arbitration Center (VIAC) (investment, finance, real estate & construction, corporate and commercial matters). Trung is also a member of Board of Representatives of MB Capital Vietnam Bond Fund (MBBF) and MB Capital Value Fund (MBVF) managed by MB Capital. Capital Market; Corporate and M&A; Finance; Insurance; Investment and Real Estate & Construction; Dispute Resolution. Graduate Diploma in Law (Commendation), a conversion course providing for legal background for qualification as a solicitor or barrister of England and Wales. Reviewing custodial services agreement and supervisory services agreement with various top foreign banks operating in Vietnam, such as HSBC, Citibank, Deutsche Bank, etc. Drafting and implementing corporate and investment compliance policies related personal investing, trade allocation, best execution, conflicts of interest, third party related transaction, valuation, anti-money laundering and anti-terrorist financing, corporate reputation risk, procurement procedures, etc. for 1 life insurance company, 1 local fund manager, 1 offshore investment manager and 3 funds under their respective management. Representing a life insurance company in over 10 lawsuits related to insurance claims before court of various provinces within Vietnam. "The economic consequences caused by the lengthy civil proceedings" on The Saigontimes (No. 22-2015, dated 28/5/2015).